The Miami Marlins don't have any Hall Of Fame Players in Cooperstown, NY, but they do have one in the front office. His name is Tony Perez, 72, the Cuban native, who serves as the Assistant to The General Manager. Perez was inducted into the Hall Of Fame Class of 2000 and he did it with a .279 average, 2,732 hits, 379 HR and 1,652 RBI. During the third baseman's 23-year career, he never went on the disabled list. His #24 jersey is retired by the Reds. Perez has also appeared in seven All-Star Games and has won three World Championships with the Reds. Two of those titles were with the Big Red Machine in 1975-76 managed by former Tigers Skipper Sparky Anderson. The other championship was as hitting coach for the 1990 Reds. Like former Detroit Tiger Joe Coleman, who is the pitching coach for the Jupiter Hammerheads that play in Palm Beach County at Roger Dean Stadium (photographed), Perez is a baseball lifer. Perez and I recently talked about his career and life with the Marlins in this Exclusive Interview. Q: How much did your days mean to you as a member of the Big Red Machine? A: They were great days. We had a great team, guys that can go out and play everyday and win. There were so many great players like Johnny Bench, Pete Rose, Joe Morgan, Dave Concepcion, George Foster, Ken Griffey Sr. and Cesar Geronimo. Everybody on that team was great. Sparky Anderson was a great manager. We just went out to play everyday and win. Q: Doesn't it seem like yesterday that you were playing? You look great at 72. A: It's been a few years, but I still remember those days and I don't feel that old, but it's been over 30 years. But you never forget when you play that good, and win, plus you have super teammates. Q: Lets talk about your existing situation with the Miami Marlins. I know they struggled the past couple years. The last time I was at this ballpark was on September 29, 2013 when they completed a three-game sweep of the Detroit Tigers, which culminated with the Henderson Alvarez 1-0 no-hitter. The Marlins finished the season 62-100 with a .383 winning percentage, 34 games back of National League East Champions, The Atlanta Braves. How much have they grown? A: This year, we've grown a lot. We have some younger players who are improving and helping us. Our pitching has been good. We've struggled in the last three years in last place, but that's happened to us over the years. I've been with the organization since 1993 and we've changed owners and stuff like that. We trade people and we change everything. This year from now on, we're going to be a more successful team on the field. That's what we do and we'll play a lot of good young players to do it. Q: How difficult has it been for the Marlins since they've changed ownership multiple times to create a steady following with the fan base since they've moved many star players including current Tigers MVP Miguel Cabrera and former Detroit catcher Ivan "Pudge Rodriguez? In Cincinnati, you didn't have that problem like you do in Miami. A: The fans have been good this year. Before, we made some big trades and the fans got real mad and they stayed away from the ballpark. Now they're starting to come back. We have a better relationship with the fans because we have a better team and they realize that we acquired good young players in those trades that are playing much better. I think they understand we made good baseball trades. Q: Do you see this ownership staying with the good core of young players instead of trading them? A: We're going to try to stay with these young players. We have good young players in the Minor Leagues. I think they'll help us in the near future. We're going to be better, a lot better. Q: You went from Joe Robbie Stadium to Marlins Park. What's it been like changing venues? A: It's been a big change. This ballpark is one of the best ballparks in the league. It's great, the fans love it and every ballplayer loves it. I think they will come back. This ballpark helps us because the other stadium wasn't a baseball park. Q: How are you feeling these days? A: I feel great. I enjoy spending time with the team, doing a lot of exercises, cardio and stuff like that. I feel like I'm 50. Q How much money do you think you'd be worth under today's pay scale? A: I don't think about that. I can't complain about my career. I played with great teams, great teammates, and I did win a couple World Series with the Cincinnati Reds. I played in All-Star Games and I'm in The Hall Of Fame. I can't ask for anything more from this game. Q: Since Marlins Park is located in South Miami, do you see it selling out a lot? A: We have to create sellouts here. We've been only here 21 years and we've never had fans here because baseball has never been big in this town. Now with all the little kids, they are Marlins fans and maybe in 15-20 years, they'll have the same type of good following like they do in other cities. Q: Lastly, so you're telling me you can see 25-30,000 fans on a regular basis? A: Oh yes. I think if we start winning here, we'll see that. As of this posting, the Marlins are currently at the .500 mark with a 62-62 record matching last year's win total and are 8.5 games back of division leading the Washington Nationals. Former Tigers Pitching Coach Chuck Hernandez is leading the young hurlers and Miami features one of the best young managers in baseball in Mike Redmond. It will be interesting to see if this team gets into the playoffs, but they've come a long way since the Fall of 2013. Thirty five years ago, former Detroit Tigers Pitcher Joe Coleman arrived at the right time to be a late season acquisition for the Pittsburgh Pirates, just in time to earn a World Series Ring for the group known as "We Are Family." Long before Coleman earned this piece of jewelry, he was involved in an eight-player trade on October 9, 1970, as the Detroit Tigers acquired him, Eddie Brinkman, Jim Hannan and Aurelio Rodriguez in exchange for Elliott Maddox, Norm McRae, Don Wert and baseball's last 30-game winner, Denny McLain. The Tigers made out well in this trade as Coleman, Brinkman and Rodriguez were a major part in Detroit's 1972 Eastern Division Championship, only to lose to eventual World Series Champion, the Oakland A's. Coleman would go on and pitch six seasons with the Tigers compiling an 88-73 mark, starting 201 contests, completing 56 games with a 3.82 ERA. 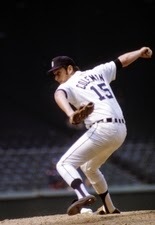 During his first season in Detroit in 1971, Coleman was 20-9 with a 3.15 ERA in 39 games started with 16 complete games in 286 innings pitched. The 1972 campaign saw Coleman go 19-14 with a 2.80 ERA, starting 39 contests, completing nine games in 280 innings pitched. During his career, Coleman would play for the Washington Senators (1965-1970), Tigers 1971-1976, Chicago Cubs 1976, Oakland A's 1977-78, Toronto Blue Jays 1978, San Francisco Giants 1979, and the Pirates in 1979. He compiled a 142-135 mark with a 3.70 ERA, struck out 1,728, in 2,569.1 innings starting 340 games and completing 94 and also had seven saves. Coleman is 67-years old and is far from retired. He serves as the Pitching Coach For the Jupiter Hammerheads, The Miami Marlins Class A Florida State League team. League squad the Lakeland Flying Tigers from 2007-2011. He is a baseball lifer in every sense of the word and I had the opportunity to do a comprehensive interview with him at Roger Dean Stadium on a lot of great subjects. I've had a lot of great interviews over the years, but I have to admit this conversation brought many great memories of My Childhood following his accomplishments with the Tigers in the 1970's. My conversation with Coleman also enlightened me about the game of baseball here in the 20th Century. Q: What was your reaction being traded for McLain? A: It was very exciting for myself and the other people involved in the trade. The Washington Senators were rebuilding and we knew going over to Detroit, we'd be going to a contender. It turned out we were very successful over there. Q: Two of the players in the trade, shortstop Brinkman and third baseman Rodriguez had good runs in Detroit. Would you agree? A: In those days, Baltimore had Mark Belanger at shortstop and Brooks Robinson at third base. But Brink and Aurelio were just as good defensively. We had a good nucleus over there and bringing those guys over to play everyday really helped our club. Q: How did you like playing for Billy Martin? A: It was a little on the tough side with some of the ranting and raving. But he was one of the better managers when it came to managing the game that I've been around. But you had to put up with a lot of other things and it was tough that way. When the game started, he did a very good job. 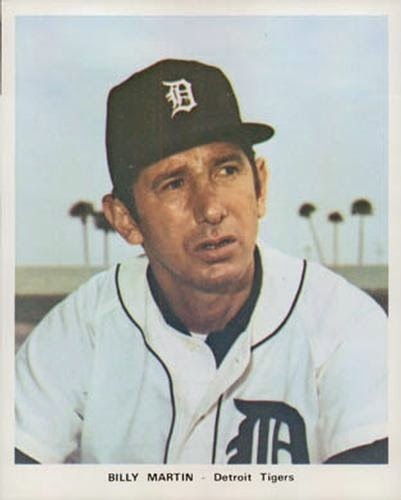 Q: Do you think Billy Martin could have managed in this day and age? He's a little bit different in a sense that at times, he was a disciplinarian, but he was more of an old school type of manager. I think he would have a very difficult time managing some of the people who you have to deal with now that are on long term contracts, and stuff like that. In those days, he had done a very good job every place he had been, if you could eliminate the off the field stuff. Front office people today wouldn't put up with some of his things he did in those days. They are so much more different. Back then the majority of those people were baseball people. Now, they're businessmen running teams, computer people running teams, and I don't think he would fit in right now. Q: It was interesting watching Billy with the New York Yankees, especially the way he interacted with Hall of Fame outfielder Reggie Jackson, wasn't it? A Billy was very, very, high strung and he wanted to let everyone know he was high strung. Right now you have a guy in charge, but the reins are a little bit looser than they were in those days. Q: How would you define your Tigers career? A: I'm very happy with it. I love the city. I lived in Lathrup Village, MI which was very, very nice and about 25 minutes from the ballpark. I loved the old ballpark (Tiger Stadium) because it was old and had some different alleys to it. Q: What was it you enjoyed the most about your time in Detroit? A: I enjoyed the fans; they were positive fans. It was a historic ballpark and the Tigers organization was run by quality people that made it as easy as possible for us. It was all the little things you needed to keep your mindset in the right place. Q: Before you were traded to the Chicago Cubs, Mark "The Bird" Fidrych was your teammate briefly. What was that like? A: Mark was my roommate for the short period I was with him. He was definitely something special. And all of it was legitimate. People thought he was putting on a show. But it was legitimate. He did things people wanted to see. The large crowds proved it. Whether he pitched at home and on the road, there were a lot of people that want to watch him. Q: Not only did a lot of people want to watch him, but during the Tigers lean years, his games were being televised nationally including on Monday Night Baseball. What was it about Fidrych's style that made him so successful in a short period of time? A: It was his style because he had fun out there. People like to see you have fun out there. He talked to the ball, would get on his hands and knees and fix the mound and everything. But the pitch ability, he was one of the best young pitchers I've ever seen. It was too bad to see him get hurt early in his career. He was the joy of that town in the Tigers transition period going from a contender to rebuilding. Q: Let's talk about today's game. Is specialization good or bad for baseball? A: I don't like it, but you have to sway with things. A lot of things being old school with me and there are a lot of things that happen in the game that I don't agree with. Video replays is like we're trying to reinvent the wheel and staying on the cart for an awful long time. Now all of a sudden, we're doing this, that and the other thing. One of the biggest mistakes they made was the Designated Hitter. You have the same game, two leagues and one playing it traditionally while the other reinvented the wheel. Managers in the National League have to manage, while in the American League, sometimes all they have to do is just put the lineup card out. There goes the game right there. In the American League, they have to change pitchers on occasion, but you don't have to double switch, don't have to worry about bunting, not as many hit and runs, and less pinch hitting. The American League is a power league while the National League is a historic league. Q: Lets talk about complete games. When you played, they were the norm. Do you think there should be more of them now since pitchers get extra days rest? A: The game has changed and I can say whatever the heck I want to you about it. But agents are involved, and you want your client to be around a long time so they sort of stepped in. One thing that really bothers me is the statistic Quality Start. A Quality Start is six innings and less than three earned runs or less. If you pitch six innings and give up three runs, that's a 4.50 ERA and is that a Quality ERA? No. The agents have gotten involved a little bit, where we limit pitches, pitch counts, limit innings pitched. So we're going backwards, not forward. Q: What are your thoughts about pitch counts? A: In the Minor Leagues, we have pitch counts. If you're in the Big Leagues, you're expected to throw pitches. So who knows if the guy can run from 85-100 in the Big Leagues because he's never pitched when he was tired in the Minor Leagues. Q: This leads me to my next question and that's innings limits. A classic example was a couple years ago was when the Washington Nationals shut down their ace youngster Stephen Strasburg on September 8, 2012 while they were in World Series Contention. At the time, he had a 15-6 record in 159.1 innings with a 3.16 ERA. Since then from 2013 to date, he's posted a 17-19 mark. What are your thoughts here and was that unheard of in your era? A: We were pitching every fourth day. They gave you the ball and expected you to go right to the closer if you couldn't complete the game yourself. I remember I had 180 some odd pitches and worked 11 innings that day. Q: Why are we seeing more Tommy John Surgeries which is disturbing? A: There are a lot of people that will have their theories on it. I think one of the big things is Weight Training. Pitchers are doing too much of it. I've expressed my opinion on this where ever I've been. The other thing which came out in Baseball America and the video guy and I checked here that the last 14 pitchers which had it, 13 of them were pitching from the Nontraditional Side Of The Rubber. Traditional, right-handers, pitch to the third base side, Nontraditional, left-handers pitch to the first base side. I repeat, 13 of 14 on the Nontraditional Side of The Rubber. A week later, one of the pitchers on the staff brought an article from Baseball America and it showed the last 146 Tommy John's, 10% pitched from the Traditional Side of The Rubber, the other 90% from the middle of the rubber or Nontraditional Side of The Rubber. What it is that as a pitching coach, you're always talking to pitchers about their front side. If they start rushing the front side, the delivery gets out pretty quick. If you're on the Nontraditional Side, you're almost throwing the ball backwards. The arm doesn't like doing that. On the Traditional Side, the arm has more resistance. If you follow-up your front side there, you still have plate coverage. If you follow your front side, and it's too quick from the other side of the rubber, you end up throwing the ball backwards. Q: So you're telling me that these pitchers are throwing awkward because of the nature of the way the ball is being thrown, you're working against your body, thus it's causing harm to the shoulder and arm itself? A: Like I said, Baseball America did the study and I saw it a week after we started doing research on it here, and the numbers don't lie. Q: How would you compare shoulder issues back when you played as to the way things are? A: When guys had broken elbows, we turned a lot more in those days to the point where we had resistance, where we throw against. Now you see a lot more pitchers go straight in. We had longer strokes in those days, extension out of the glove and out front, where you don't see it as much. That can be a contributing factor with the Tommy John Surgeries. Q: We spoke about Billy Martin earlier. How would he have handled today's pitchers? A: That's a question that will be difficult to answer because it's six innings for a starter, then you have your set-up guy, and then your closer. He probably wouldn't have done that and if he didn't do that, the computers said, you're fired. He was one of those old school people that gave you the ball and told you to pitch nine innings. If you didn't get there, you better get close. Q: I miss the days of the 2-3 innings closer. What about you? A: Yes. Again, the game has changed and people are specialists and you use them to a point where you try to protect your closer. Now you might see a closer pitch two innings in a tie game if they're home sometimes. You might see them with two outs in the eighth inning. But very seldom would you see your closer go out and pitch three innings. Q: Do you think closers like Trevor Hoffman (601) and Mariano Rivera (652) saves, that this statistic has been cheapened since the game has been reduced to the one inning compared to the two or three inning save? A: No. I think the save rule is fine now and is very good. Usually, when the closer comes in, he faces the heart of the line-up 75% of the time. Very seldom does he face the 7-9 hitters because the game turns over. I don't mind what the save is right now because even if I did, it doesn't make any difference. You might see set-up people maybe pitch three innings and get a save because they're in a save situation. All of a sudden they score a couple of runs and you don't even get to your closer. So stay with the set-up guy. So you'll see three some three inning saves, but you won't see them from your closer. Q: When Nolan Ryan was recently running the Texas Rangers, he wanted his pitchers to go deeper into games. In many cases, they did. Was this refreshing for you to see that he had this approach? A: I totally agree with the stance he took. He sat back and was very, very concerned with the durability of pitchers in that organization. I appreciate him coming out and the fact that he was trying to get it back to where it was a little bit. It obviously didn't happen. It would have been nice to see. Q: What was your favorite ballpark to pitch in and who were the toughest hitters you faced? A: I enjoyed playing at Tiger Stadium and Yankee Stadium, but I enjoyed Fenway Park the most because I was born in Boston. Reggie Jackson and Rod Carew were tough to face. Q: What was it like to be teammates of Al Kaline and Mickey Lolich along with the other veterans? A: The whole group over there was fun. We had some people you wouldn't go out to dinner with, but 90% of the people you would go out to dinner with, and we played a lot of Saturday day games many of them on the road. There would be a bunch of us guys that would go out to dinner. That group was one I would remember for a long time. Q: What about Al Kaline? A: My father (Joseph Patrick Coleman) played with him and so did I. Al was a true gentleman and a Hall of Famer. He was really fun to be around. Q: How is life treating Joseph Howard Coleman these days? A: I was going to retire a couple years ago, but these people (The Miami Marlins) asked me if I wanted to take this job. I've enjoy it and it's a great place to play. We have a tremendous facility here. I live two minutes from the ballpark. But during the off-season, My wife and I just moved to Tennessee last summer. I froze my rear end off up there since I've lived in Florida since 1982. We had one of the worst winters ever up there. She's enjoying it. We have a nice place and she is a horse person. We've got three horses and she rides. It's real nice up there, but it's freezing when it gets cold. The Miami Marlins must be thankful to have Coleman's expertise in the organization. I doubt you'll ever see another pitcher in this era even reach his 94 complete games. If I had to make a prediction, I'd say that no elite pitcher would even amass 50 complete games. But Coleman is alive and well and his trade to the Tigers would still be regarded as one of the best deals or steals in franchise history. It's hard to believe the NFL Pre-Season opens up tonight when the Buffalo Bills face the New York Giants in the Annual Hall of Fame Game in Canton, Ohio. Non-stop football until February to see which team will emerge as Super Bowl Champions. Will the Seattle Seahawks repeat? Will there be a last to first story? Which squad will take that last step? What new draft choices or undrafted free agents will make an impact this season? Which players will be good fantasy football selections? We'll find out in the next four weeks leading to the start of the regular season. When I was covering the Miami Dolphins in 1982 for the Hallandale Digest, the fish drafted Yale Bulldogs running back Richard Diana in the fifth round, 136th overall. Diana had impressive numbers playing for the Ivy League School, especially during his final two seasons. The 5-9, 220 pounder amassed 1,074 yards and five touchdowns in 1980. In 1981, Diana gained 1,442 yards with 14 touchdowns. His career total was 2,576 yards. Diana would also add 426 receiving yards and four touchdowns, in addition to 229 punt and 552 kick-off return yards as well. Tell me one coach that wouldn't give this guy a chance to play in the NFL. Not bad for fantasy numbers. These numbers definitely impressed Dolphins Hall of Fame Coach Don Shula, who is the all-time winning coach with 347 wins and has two Super Bowl Championships. Diana played one season for Miami. He had eight carries for 31 yards, along with two receptions for 21 yards. In late July of 1983, Diana pulled a rarity that would unlikely happen in today's NFL with the millions of dollars being paid to the players. He walked into Shula's office, handed him the playbook, retired, then went to Medical School. Diana traded a potential life with concussions, knee, shoulder and other injuries to become an Orthopedic Surgeon. This is Diana's Super Bowl and that's to help other people out. He didn't need to get banged up and could careless about collecting an NFL Pension. Just being drafted by the Dolphins and being in their media guide was good enough. One of the major story lines the past few years has been lawsuits filed by retired players for damages as a result of long term injuries for their medical care. Sometimes, we often wonder why Hall of Fame Players like Jim Brown and Barry Sanders retire in their prime. They minimize their punishment so they don't have to ride around in wheel chairs, use motor scooters, walk with canes, and have a life after football. When a running back has hit the 2000 carry mark, that's when teams are reluctant to give long term contracts. Age isn't as much of a factor as the amount of carries which is understandable about why these players try to get the front end of their contracts loaded with guaranteed money. Many people criticized former Dolphins running back Ricky Williams for retiring early. He was concerned that Miami's offense wasn't diverse enough and he was being too depended on. When Bill Parcells took over Miami's front office, this changed with the implementation of the "Wildcat Offense" therefore, there was less wear and tear on Williams. Ronnie Brown split some of the running load and the Dolphins were actually fun to watch especially when they upset the New England Patriots the first time with the "Wildcat." Williams was also aware that Texas alumnus and Hall of Fame running back Earl Campbell is in a wheel chair and needs assistance walking. It will be interesting to see how many other players are smart enough to use their education if they're unable to fulfill their dream. While Diana could have used his NFL paychecks to pay for his Medical School, he managed fine. On September 6, Diana will turn 54. He's written books and has made his money in the Medical Field. I can only imagine how much money Dr. Richard Diana has made doing Public Speaking, Writing Books, in addition to his work in the Medical Field in the past 30 years. Hopefully, this story sheds a different perspective on not only how we view training camp, plus preseason games, but life on and off the gridiron. But unlike many NFL players, Diana left on his own terms and traded his early office at the Orange Bowl for a much different office. Considering that Diana came from the Ivy League, Shula knew that he was Drafting A Smart NFL Player! When did it sink in that football season has returned? Was it the Hall Of Fame Induction Ceremony from Canton, Ohio last night followed by the game tonight featuring the New York Giants and the Buffalo Bills? Last Night, Candy and I selected players in a Fantasy Football Draft, the first of three leagues that we'll be participating in this year. During a four day stay at JFK Medical Center due to Pneumonia, I had a chance to prepare for football season as I watched constant training camp reports and took notes. Whatever it is, Football is Back. Here are a few points worth mentioning. The Pittsburgh Steelers have announced they will retire "Mean" Joe Greene's No. 75 in a ceremony on November 2, when they host Baltimore at Heinz Field. I'm surprised it's taken so long for this to happen. It's unfortunate that Greene's former head coach Chuck Noll won't be around to see it. Noll died on June 13, 2014 at the age of 82. Also, it's too bad Greene wasn't an assistant coach these days because the Rooney Rule, which was established in 2003, requires teams to interview minority candidates for top coaching and football related jobs, and would have given him a shot to interview for a head coaching position. He was mentored by Don Shula and Noll, who have six Super Bowl titles between them. Shula won 347 games and Noll has 209 victories and both are in the Pro Football Hall of Fame. The Green Bay Packers have announced they've signed Executive Vice President/General Manager Ted Thompson to a new multi-year contract. Thompson deserves the security because he had the thankless job of overseeing the Brett Favre passing of the torch transition to Aaron Rodgers. That would have been a tough task for any executive. Last year, the Packers survived an abundance of injuries, juggled quarterbacks, in addition to the Detroit Lions late season collapse to reach the playoffs. Green Bay is expected to be a favorite to reach the post-season again. Finally, we had the good pleasure of covering the Capital One Bowl in Orlando, FL featuring the Wisconsin Badgers against the South Carolina Gamecocks. I spoke with a player who could have helped any NFL team but he decided not to pursue professional football. His name is Zac Matthias, a 6-5, 318 pound offensive lineman from Hemlock, MI. Matthias (pictured with me) told me after the game that he already had a job lined up after he graduated this year. He didn't want to be bothered with the NFL Scouting Combine, Pro Day's therefore, any thought of being drafted or being an non-drafted free agent was never on his mind. Matthias wasn't looking to follow the footsteps of a former Badger Offensive Lineman Joe Thomas, at a school which is known for producing running backs as well as offensive linemen. A few running backs that come to mind include, Alan "Iron Horse" Ameche, Ron Dayne and Montee Ball. Matthias has elected to use his brain and defines what the true meaning of the words, Student Athlete, which gets lost in collegiate sports. Student Athlete is overshadowed by wins, losses and national championships. So when you don't hear Matthias name during the preseason or in the regular season, just remember that he's just trying to make a living off the gridiron.